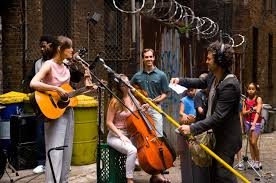 Jay watched and reviewed this movie awhile ago and I can’t say that mine would look much different than hers so I won’t bother with a full review of Begin Again, director John Carney’s somewhat disappointing attempt to relive the magic of Once. 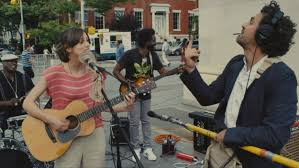 All I’ll say is that Keira Knightley and Mark Ruffalo do their best to replicate the improvised feel of Once but it really would have worked better with less recognizable faces. What I do want to comment on is the recent Oscar nomination for Gregg Alexander and Danielle Brisebois’ original song Lost Stars. 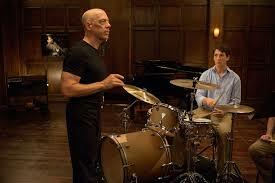 The music really is the best part of the movie. Even when the songs don’t leave a lasting impression the way those in Once did, Carney films the recording sessions in a way that makes you want to pick up a guitar and jam with them. Carney has always been good at capturing the evolutions of songs as their written and continue to change each time that they’re played. There are a lot of songs written for Begin Again and I’m not sure Lost Stars stood out for me. It is one of the better examples though of a song evolving over time with Adam Levine’s hilariously over-produced butchering of it alone making the song worthy of recognition. It can’t win though. I had mostly forgotten about the song almost as quickly as I had forgotten about the movie itself and, when being forced to compete with a movie with the emotional impact of Selma and a song with the emotional impact of Glory, there’s really no contest. This entry was posted in Movie Reviews and tagged Adam Levine, John Carney, Keira Knightley, Mark Ruffalo on January 20, 2015 by Matt.